This blog is dedicated to our winter project…. 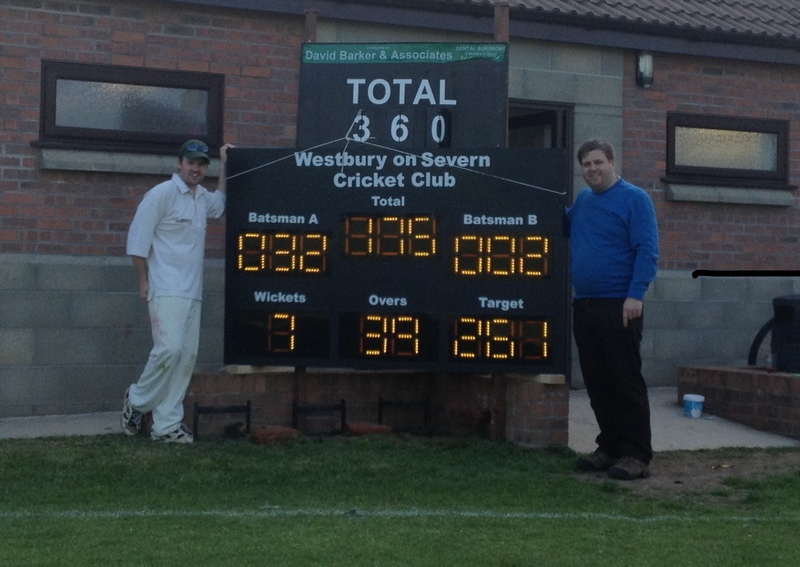 building a massive electronic scoreboard for our cricket club on a shoe-string budget. Electronic scoreboards are usually the preserve of big clubs. Although we have generous members, spending £4,000 + on a fancy electronic scoreboard isn’t on the list. We want to build one for 10% of that, and learn some stuff along the way. This website shows you our journey, and provides detailed instructions so you can start build your own! Installed in an amazing score shed in 2015. This project was started by two middle aged blokes from Gloucestershire, with a bit of help from a third (when he wasn’t busy getting rid of flood water from his house). Before we started we had no experience of electronics, and we have been learning as we have gone along by using ideas from lots of other peoples work. Please don’t read this blog and think you couldn’t build a project like this. If we can, you can! In fact, don’t just take our word for that. We know about builds in four different continents around the world, and modifications for use for Lawn Bowls, American Football, Baseball, Volleyball, Rugby and Tennis. Take a look at our other builds pages for inspiration and look at our map of the world! The scoreboard itself is approximately 1910mm x 1220mm x 115mm, built using outdoor ply board and laser cut plastic covers to make it look smart. Inside the board is a whole lot of electronics, and whilst we used sealant to keep it all dry the scoreboard isn’t designed to be left outside in the rain. The scoreboard is operated using a laptop or tablet device, which connects to the scoreboard over a wireless network. It can even be run from a mobile phone, but the interface is a bit fiddly on a small screen. At our club we found it to work well at distances of up to about 100 meters. Our homemade scoreboard was built using items mainly bought from ebay. The scorer uses a laptop or tablet, and connects to a private wireless network advertised by the scoreboard. The scoreboard hosts a webpage on a Raspberry Pi computer, which sends score updates to a Arduino Uno micro-controller. The micro-controller sends simple serial signals to a set of shifter circuits, which control some LED light modules. It might sound complicated, but we were inspired after seeing similar projects on the Internet. We managed to build it with 0% experience of electronics. It took a long time, but was a lot of fun and we are really happy with the outcome. We hope the instruction on this website inspire you to start your own project, However, if you embark on your own project you do so at your own risk. As with all projects involving electricity, we strongly recommend that you take advice from a trained electrician before it is connected to a mains supply. The authors provides the information on this website on an “AS IS” BASIS, WITHOUT WARRANTIES OR CONDITIONS OF ANY KIND, either express or implied, including, without limitation, any warranties or conditions of TITLE, NON-INFRINGEMENT, MERCHANTABILITY, or FITNESS FOR A PARTICULAR PURPOSE. You are solely responsible for determining the appropriateness of using the Work and assume any associated risks.